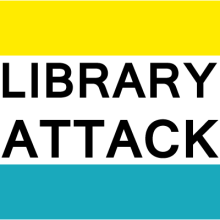 Library Attack is supposed to be yet another library-themed blog that explores and examines the hip happenings and trends in library science. I originally started doing this on my personal blog – kendrak’s attack– but I knew most of the people outside of the library world didn’t really care about new technologies in libraries or the implications of tagging and social networking. Thus, I’m shifting all my library content here. I also will try to keep my ranting about sports and music outside of here. Professionally, I’m Kendra K. Levine and currently working at a small subject-specialty library. I graduated from Drexel University with their dual MSLIS/MSIS, and was just hired as a reference librarian at the Institute of Transportation Studies Library, though I really seem to spend the days keeping up with emerging technologies and web stuff. You can mail me.